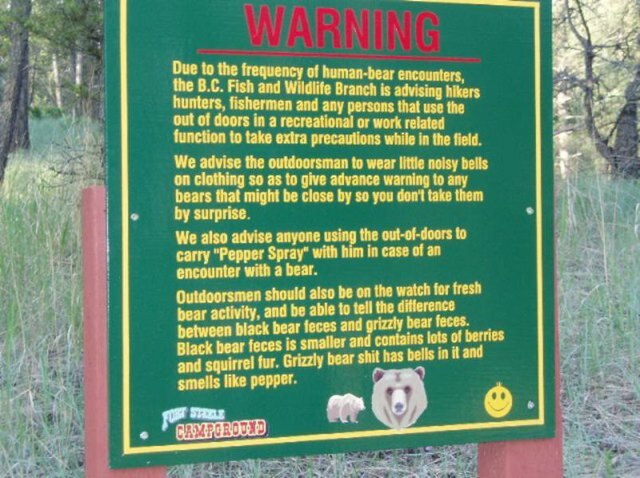 Welcome to Canada's wildlife parks..
K100-forum.com » Off Topic » Humor » Welcome to Canada's wildlife parks.. This reminds me of the 'please pick up your dog's mess' signs in the parks in Tenino BC which have words written out in English for humans and in 'woof woof' for dogs. The author had some fun doing it. Yep I saw that too. Funny. That's why I like living here in Australia. Go camping in the bush and nothing is going to eat you. I know, I know. No sense of adventure. Nothing is going to eat you in OZ, but most snakes will poison you, as will a lot of spiders and other insects (think redback) and some plants will leave you with a nasty rash, and if you're up for a swim, more than a few jellyfish will casually drift past and leave their mark as a reminder, saltwater crocs and sharks will likely have a go at you with their sharp teeth and powerful jaws, and if it's hungry enough a dingo might 'steal your baby'. But other than that, nothing will actually eat you. Yeah agreed, but if you're sitting there minding your own beeswax, nothing much is going to ATTACK you. So all you internationals on the forum, come on over, it really is a nice place! Now before we get the tourists feeling content about the place, hang on just a mo', you've clearly forgotten about Dropbears! They are daaaaangerous creatures! Note to self...don't go outside. As noted above crocs will go for people who are close to or in the edge of water they come at high speed under the water, surge up out onto the bank grabbing the person and pulling them in. Since the protect all creatures regardless of danger to humans types got the upper hand there are lots of them. Enough for a friend living up in Darwin to move his family totally away from the region. Well, at least he and his family are safe from crocs, now all he's got to worry about is death & taxes. There's no known natural predator against those ferocious beasts. So true TWB and the latter can pursue your estate even after you die!